As many of you know, I have spent the majority of my writing time since the 2013 publication of The Irish in the American Civil War concentrating on one major source for the Irish experience of 19th century America, namely the widows and dependent pension files of Union soldiers and sailors. It soon became my intention to develop this material into a book, though I struggled for a long time to develop a structure and layout I was happy with (always the most difficult part of any book project). Having finally overcome “Difficult Second Album Syndrome,” I submitted the manuscript to my publishers a few months ago. 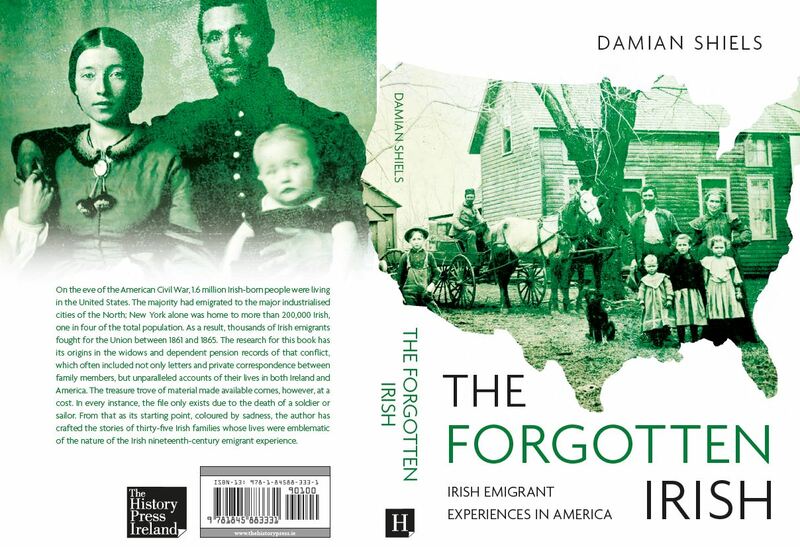 This week I received both the final page proofs and the finalised cover art for The Forgotten Irish, which I thought I would share with readers, many of whom have been instrumental in both assisting with my research and in encouraging my endeavours. It is also an opportune time to outline the contents of the book, which is due for release in Ireland around November 2016, and hopefully will become available in the United States not too long after that. The premise behind the book is to demonstrate how we can use the widows and dependent pension files, in conjunction with other sources such as census, military and emigration records, to build a partial picture of the lives of individual Irish emigrant families. 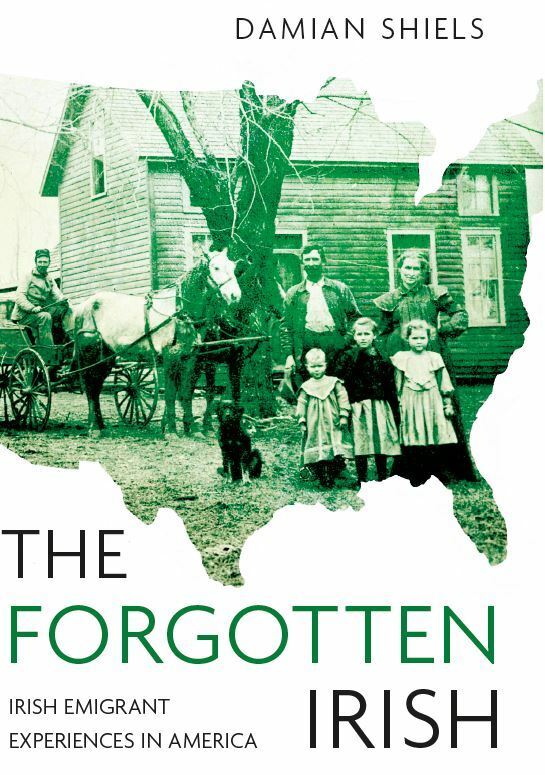 Though the material was created as a consequence of the American Civil War, the focus of many of the chapters is not on the conflict, but other aspects of the lives of those left behind. It is my contention that the files offer us the best opportunity to examine in close detail the experiences of Irish emigrants across the second half of the 19th century (and indeed into the 20th). In many instances, these emigrants describe their lives to us in their own words. Another important element of the book was to demonstrate that the American Civil War had a major impact on people in Ireland; to that end, many of the chapters ‘follow’ families back and forth across the Atlantic, and indeed a number of the pension recipients covered both lived and died in Ireland. To provide readers with some more information, I have included the description on the book cover (the ‘blurb’) below, together with the section and chapter headings, to give a flavour of its contents. On the eve of the American Civil War, 1.6 million Irish-born people were living in the United States. The majority had emigrated to the major industrialised cities of the North; New York alone was home to more than 200,000 Irish, one in four of the total population. As a result, thousands of Irish emigrants fought for the Union between 1861 and 1865. The research for this book has its origins in the widows and dependent pension records of that conflict, which often included not only letters and private correspondence between family members, but unparalleled accounts of their lives in both Ireland and America. The treasure trove of material made available comes, however, at a cost. In every instance, the file only exists due to the death of a soldier or sailor. From that as its starting point, coloured by sadness, the author has crafted the stories of thirty-five Irish families whose lives were emblematic of the nature of the Irish nineteenth-century emigrant experience. The death of a spouse or child as a result of military service has a profound impact on all those left behind. For some Irish emigrant families, the loss was an event that irretrievably altered their futures, casting a long and dominant shadow over them in the years to come. For others, it represented another hardship in what was already a struggle for survival. ‘Wives and Parents’ examines the stories of both. The widows and dependent files offer us much more than details on the American Civil War. In their pages can be found the social history of families across decades. In ‘Community and Society’ we see how chain migration could influence people from the same parish across multiple generations, or tempt groups of skilled local workers to relocate across the Atlantic. We follow the lives of families from their origins in Ireland– where some suffered personal loss in the Great Famine– to new but not necessarily better futures in the United States. There are few more powerful echoes of the past than the letters left behind by those who experienced it. The widows and dependents pension files of Irish-Americans contain thousands of them. When combined with the wider story of a family’s experience, this correspondence can offer an additional emotional layer to our understanding of their story. The central event that ties all the widows and dependents files together– and led to their creation– is the death of a soldier. ‘A Death in Letters” focuses on this event as it was experienced by eight different families. Congratulations, Damien. Another outstanding addition to Irish-American research. I look forward to having it on the shelves of my library – and that of my friends! Thanks Maura! Let me know how you get on with it! The posts here on just these same people (widows and orphans, and what happened to survivors) have been so interesting! I’ve passed on many of them to friends & relations. I hope to buy this book. I will definitely but it. Best of luck. Will definitely have your book on my wish list!! Congratulations Damian. This is truly pioneering and long overdue work, so best wishes and good health to you. Super! I look forward to your publication. I thoroughly enjoyed your first! cannot wait to read the book, James Murphy, Baltimore, Maryland. found a Union soldier with similar name to mine from Mass buried at Antietam. What became of Col O’Brien’s widow Anna after her pension was denied? I am not sure, it is something that I would love to find out though! It will be great to have so many of these stories I have followed on your blog in one place. But Amazon in the US is saying it won’t be available til May 1 of next year. Can that be right? It is unfortunately, though you can order it from over here, it will cost a bit more in shipping.